Sohan Halwa: Sohan Halwa is a traditional sweet in Iran, India and Pakistan. It is a specialty of the cities of Karachi and southern region of Pakistani Punjab including Multan and Dera Ghazi Khan. It is made by boiling a mixture of water, sugar, milk and corn flour until it becomes solid. Saffron is used for flavoring. Ghee is used to prevent it from sticking to the pan. Almonds, pistachios and cardamom seeds are added. Blanch almonds and pistachios in two cups of hot water for five minutes. Drain the almonds and pistachios, peel and slice finely. Mix the food coloring with lemon juice. Dissolve sugar in two cups of water. Boil the water sugar mixture for five minutes. Boil the mixture for another five minutes. Dissolve the cornstarch in two cups of water. Add the dissolved cornstarch to the syrup. Cook the cornstarch-sugar syrup on medium heat. As the mixture starts turning into a lump, add the lemon juice-food color mixture. Stir continuously, adding a little ghee every time the mixture starts sticking to the bottom of the pan. Cook till the mixture leaves the sides of the pan and forms into one whole lump. Keep 1/4th of the finely sliced almonds and pistachios for garnishing. Add in the green cardamom powder and rest of the finely sliced almonds and pistachios, keeping aside a few nuts for garnishing. Put the sohan halwa on a greased thali and even it out. 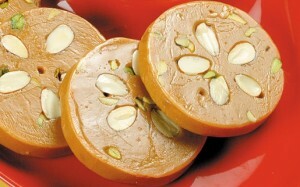 Decorate the sohan halwa with the remaining almonds and pistachios. Cool the sohan halwa to the room temperature. Cut in the pieces of desired shape and serve. If you have any queries regarding the Sohan Halwa recipe, please leave a comment.